Well guess I spoke too soon about me not getting sick. We had a great visit with Pam and Werner Saturday afternoon and evening. Greg and I watched a movie before turning in. When I laid down, I felt queasy. You know the rest of the story. So evidently he didn’t get sick from his food, but from a virus of some kind, which I then had two days later. So Sunday was spent with me in bed and Greg doing laundry, walking around, and sitting outside. It was a beautiful day. He had a “picnic” for lunch, which means he sat outside and had a pack of crackers and drink. Pam and Werner came by in the afternoon but didn’t come into the RV. Unfortunately we were going to have a cookout Sunday evening at Pam’s house but I was not able to go, and Greg didn’t want to leave me alone; plus we didn’t want them to get sick from us. Monday morning I am feeling much better and had a little breakfast. We are going to stay in Cody Monday, get my strength back, do some housecleaning, etc. before we move out in the morning for Yellowstone. We’ll stop by WalMart for a few supplies before we get into park. We are only about 50 miles away from the east gate of the park. We are following weather reports for the park, and today the high is going to be 38 and the low tonight will be 17 degrees. But it is supposed to warm up as the week progresses. We have a generator and gas for heat so we should be fine. There will be no electricity in the park. No cell service. We will be out of touch for at least three days, but we’ll call the boys from a land line during our stay in the park. I’ll update my blog when we get back to civilization. So sorry to hear you got sick. Hope you have all that stuff behind you and that it is nothing but smooth RVing from here on. Enjoy your time in Yellowstone and say hello to all the animals for me. Take care, stay safe and it sounds like you might need to stay bundled up. We would like to have a little of that cool air here because it was HOT and HUMID yesterday. Looking forward to all your adventures in Yellowstone. Well glad to hear you are now better. Have fun in yellowstone and stay warm. Watch out for the bears!!!! Hey Hey Boo Boo! 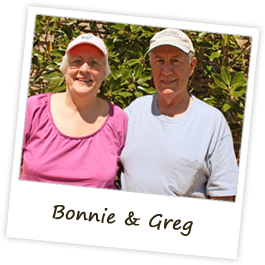 It’s Greg and Bonnie from TN! Hope your pic-a-nic basket is full of goodies and you have a wonderful time with the mooses and bears! Well you knew it would be inevitable that you would get sick, too. When you live in a small area – you’re bound to share the germs! Two years ago we came through Yellowstone IN MAY and the campground we stayed at, right near the entrance to the park, had 2 feet of snow on the ground. They just plowed out the driveway for each trailer. The picnic tables had snowed piled on top of them. That’s just WRONG! LOL! The weather was beautiful 2 of the 3 days we were there. The one day it snowed and sleeted and was miserable. But of course we were out and about touring the park! Have a wonderful time there.